By applying different predictive maintenance techniques, ElectroRyama analyses and evaluates the status of electrical or mechanical components, with the aim of offering precise, timely information, making it possible to carry out maintenance operations only when necessary, anticipating problems and reducing the costs associated with non-programmed halts. The information obtained by studying the different physical and chemical properties of lubricating oils, such as their viscosity, additives, contaminants or the morphology of the particles in suspension, makes it possible to reach conclusions regarding the status of the internal components of the machine, and based on the results, to make the applicable recommendations in each case. 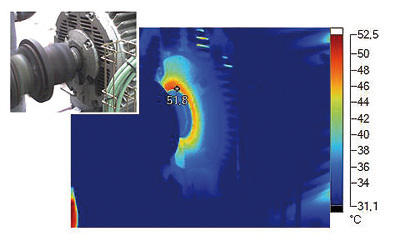 This technique, used with electrical and mechanical equipment, consists of evaluating the temperature increase experienced by components when they work beyond their specifications. By observing their thermal behaviour, it is possible to identify defects and evaluate their severity, making it possible to anticipate faults. By using endoscopic video it is possible to carry out visual inspections of the internal components of machines. These are accessed using the openings normally included in machinery for this purpose, without the need for costly dismantling procedures or prolonged halts. This is an ideal instrument for the maintenance and conservation of machinery in all types of industrial installations. Each of the internal elements in machines, normally bearings and gears, have their own characteristic vibration pattern or spectrum. By knowing this pattern, it is possible to identify any deviations that may indicate the incorrect operation of a part of the machine. By studying specific physical parameters (such as vibrations, temperatures, oil analysis or insulation) and their development over time, it is possible to obtain vital information on the status of the internal components of machines, and specifically, how well they are operating. This makes it possible to not only detect operational problems, but also design and/or assembly faults. 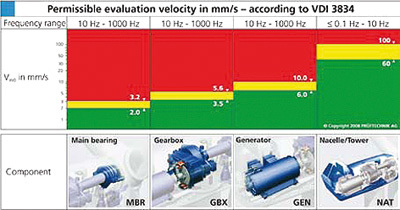 Until now, there has not been a standard that establishes suitable acceptance criteria for vibration values in wind turbines. In fact, the ISO 10816-3 standard explicitly excludes its application to this type of machine. 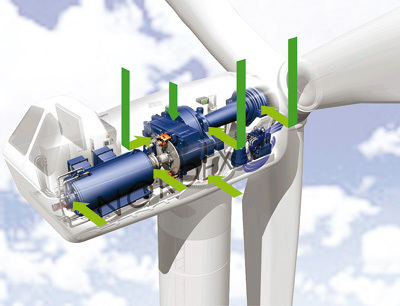 The VDI 3834-1 standard developed by the Association of German Engineers (Verein Deutscher Ingenieure) in collaboration with technologists and manufacturers, does consider its application in wind turbines, establishing vibration limits for on-shore machines of up to 3 MW. VDI 3834-1.